Zahlreiche Einzelausstellungen und Ausstellungsbeteiligungen im In- und Ausland: Berlin, Selb, Helmstedt u.a., Frankreich, Israel (Kiriat Bialik), Italien, Polen. Werke in öffentlichen und privaten Sammlungen. "Gerda Berger lebt und arbeitet in Berlin. Ihr Werk kann zwischen diametralen Polen der farblichen Abstraktion und figurativen Kunst platziert werden. Gerda Bergers künstlerische Ursprünge liegen in der Kunst des Informel, jener bestimmenden Kunstrichtung im Europa der Nachkriegszeit, mit der ganze Generationen von Künstlern wieder den Anschluss an die internationale Moderne vollzogen. Ein wichtiger Wesenszug des Informel war der völlige Verzicht auf eine inhaltliche Syntax bei gleichzeitiger Betonung des Subjektiven und Visionären. 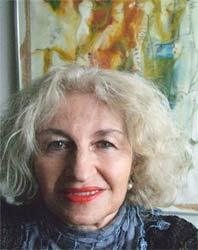 The painter Gerda Berger is based in Berlin. Her work can be placed between the diametrical poles of colourful abstract and figurative concrete art. Berger's intensive coloured and expressive paintings rely on both: The sensual presence of her colours and the hardly comprehensible, material forms and figures. Resembling archaic appropriations of the world silhouetted shapes, bodily representations and visual abbreviations allude to material existence in her monochromatic paintings. As free as her pictorial invention may seem, the subjective intuition always has recourse on objective reflection and she does not abandon the secure net of sensible structures and sign systems. Her antagonists, abstract and concrete art, are two pillars of Modernity. The balance and fathom of those dialectics an be understood as comment on former art. Gerda Berger's artistic roots can be found in the Informal art. This art movement has been the determining tendency of post-war Europe, with which a whole generation of artists found the reconnection to international Modern art. An important trait of Informal art was the total abandonment of a continual syntax and the simultaneous emphasis on subjectivity and visualise. Reaching the limitation of any possibility of expression this art movement faced a crisis. Jean Dubuffet and Antoni Tapies allowed narrative elements in their informal work for the first time. Since then the conflict of those major tendencies exist in the field of painting. Gerda Berger reflects this conflict by embedding her work in our contemporary experience realm. Series as "Auszug" (Exodus), "Weitergehen", "Verkündigung" (Annunciation) or "11 September" show the reference to cultural traditions and current events.